Lovebirds are among the smallest of the world’s parrots, and an excellent choice for those without the space for a large bird. Although the Peach- Faced Lovebird was the first species to become widely available in this country, the colorful Masked Lovebird now rivals it in popularity. Despite its very limited natural range (see below), this feisty African import is now familiar to aviculturists worldwide. The Masked Lovebird appears to have been painted by an artist in love with contrasting colors. The head is black-brown, bordered by a broad collar of bright yellow. The throat and chest are yellow, with a red-orange tinge, and the rump is blue. The balance of the body is rich green, and there is a black and red band along the edges of the outer tail feathers. The eyes are ringed in white, and the bill, rather large for such a minute bird, is red in color. A number of color mutations, including blue, have been produced in captivity. The Masked Lovebird is, like all its relatives, a small bird and barely reaches 6 inches in length when fully grown. The range is limited to a small inland plateau (3,600-5,600 feet above sea level) in northeastern Tanzania, East Africa. There are introduced populations in Tanzania’s capitol, Dar es Salaam, and in Nairobi, Kenya. The Masked Lovebird is found in open habitats – grasslands dotted with trees such as Acacia and Baobab. It apparently does not enter the heavily forested areas that border its range or the thick scrub that separates it from nearby populations of Fisher’s Lovebirds. Flocks, ranging in size from 6-100 birds, forage over large areas and may attack crops. Masked Lovebirds rarely roost in the open, preferring instead small crevices within baobab trees and similar locations. Seeds of grasses and shrubs, sprouting plants, buds and some fruit. Masked Lovebirds breed colonially, from March through August. The female uses twigs and bark strips to construct a dome-shaped nest. The nest is located within an enclosed space, such as a tree cavity or building crevice, or within the abandoned nest of another bird. They have been recoded nesting below metal roof tiles fully exposed to the African sun, in spaces as narrow as 2.8 inches. It is theorized that fresh bark strips are periodically added to the nest to increase the humidity in such situations. Brooding is apparently carried out by the female only, but the male often sits next to her, within or close to the actual nest. The 3-6 eggs hatch in 21-23 days, and the young birds fledge (leave the nest) after 41-45 days. 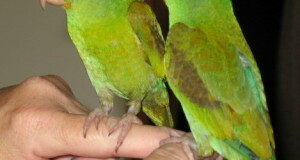 The small group of parrots known as “lovebirds” received their popular name from the near constant mutual grooming that is observed between pairs. The name is, however, somewhat misleading – in my experience, these little birds are more than make up in courage what they lack in size. They quite literally do not seem to grasp the concept of fear, and in a mixed species aviary regularly dominate much larger birds (they do, however, usually form close bonds with people). I once cared for a flock of Fischer’s Lovebirds (A. fischeri) that was housed with several duikers (small antelope). Despite being outweighed several-thousand fold, the lovebirds always fed from the duiker’s food bowls, choosing the most succulent greens for themselves. On those rare occasions when the antelope attempted to roust them, the lovebirds stood their ground, screeching with indignation and refusing to budge. They also seemed to delight in tormenting the meerkats (a small predator that could quite easily consume a lovebird) in a neighboring exhibit – I’m pretty sure they would have entered the meerkat exhibit given the chance! The 9 lovebird species are all classified within the genus Agapornis, and readily hybridize in captivity. 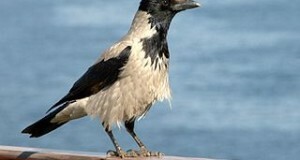 All inhabit Africa, with 8 species living on the continent and 1 on Madagascar. Lovebirds share a similar build – small and stocky – and have short, rounded tails and large beaks. Several species, including the Peach-Faced Lovebird (A. roseicollis), transport bark and other nesting material by wedging it beneath the feathers of the rump and back. Onto captive care next time.